I already wrote about buri, which is one of the nicest winter-time shiromi, so today I'll highlight one of its close cousins, hiramasa. The two types of fish are indeed related, but while buri comes into season in the winter and is reputed for being a very fatty white fish (sometimes rivaling toro in fat content! ), hiramasa season begins in June, and it is considered a much leaner fish. Its flesh is quite firm and produces complex flavors, with lovely umami and sweetness. The best specimens weigh six to eight pounds and are caught between June and the beginning of fall. 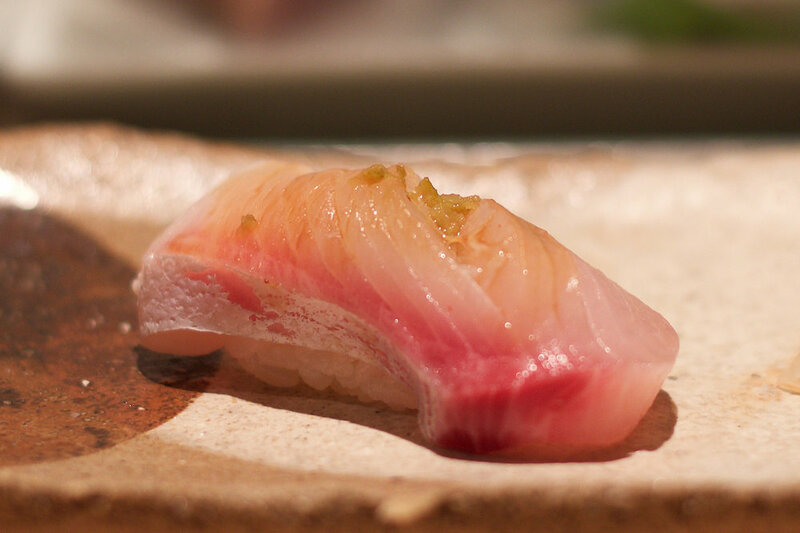 Hiramasa is a fairly rare and expensive fish, so while it is pretty well known in Japan, it tends to only be served in high-end sushi shops outside of the country.